A Federal report released last week concludes that the TSA does not have an adequate system to measure passenger complaints, has failed to factor in many complaints in its evaluations, does not consistently inform travelers of how they can file complaints, and could be ignoring complaints altogether because the agents investigating the cases are in the same chain of command as those being investigated. The report (PDF), compiled by the Government Accountability Office, will serve as a compelling source for reporters and activists who have claimed that the TSA is knowingly misleading the public on the level of backlash the agency has received. Dated November 15, the fifty page report indicates that almost 40,000 complaints were formally filed with the TSA Contact Center (TCC), between October 2009 and June 2012. 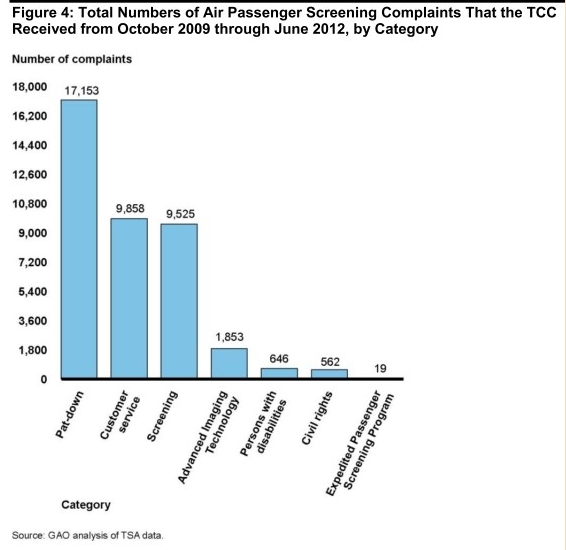 The report notes, however, that the TCC is only one of five ways that travelers are able to submit complaints, yet it is the only avenue that is currently being evaluated by the TSA. 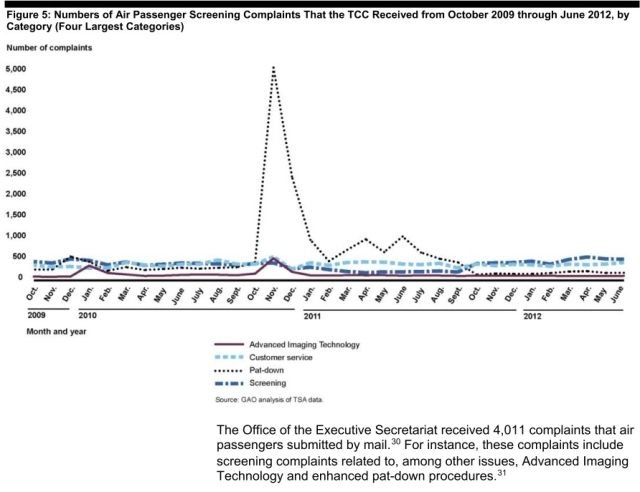 “TSA is using only the complaints received through the TCC to calculate an air passenger satisfaction indicator in its Office of Security Operations’ Executive Scorecard.” the report states. “TSA does not use data from its other four mechanisms, in part because the complaint categories differ, making data consolidation difficult,” it adds. The report notes that the other four areas that deal with complaints are not factored in. They are the Office of the Executive Secretariat (mail complaints), the multicultural branch (civil rights), the disability branch, and local TSA airport offices. “Specifically, TSA airport officials responsible for resolving air passenger complaints are generally in the same chain of command as TSA airport staff who are the subjects of the complaints,” the report notes, suggesting that greater independence as regards complaint investigation is needed. “Having a more independent complaint resolution process would better position TSA to make informed and unbiased decisions about complaints and ensure that corrective actions are taken, as needed, against screeners who are reported to have exhibited unprofessional or inappropriate behavior with air passengers,” the report states. It also notes that as things stand, TSA’s complaint resolution process fails to meet proper investigation standards of either the U.S. Ombudsman Association or the American Bar Association. The TSA has routinely bragged on its own websites that the level of passenger complaints are low considering the amount of travelers that pass through its security points. Given that we now know the TSA’s complaints process is highly flawed, such assertions by the agency can be dismissed as misleading at best. “I spent many hours over a period of weeks trying to find out any outcome to the investigation and never got a word from the TSA. In fact, to this day I’m not sure that the TSA investigated my complaint at all.” Bonner states. Engineer Jon Corbett, who exposed vulnerabilities in TSA body scanners, notes that in a recent release of filed complaints by the TSA under the Freedom Of Information Act, his own formal complaint about pat-downs was no where to be found. Indeed, the agency only released information pertaining to 201 complaints submitted by members of the public in Q4 of 2010, despite being asked to release every recorded complaint regarding pat-downs it had for that period. The new GAO report indicates that at the end of 2010 there was a massive increase in complaints, owing to the fact that the agency introduced enhanced pat-downs, as well as a raised public awareness due to media coverage of the first national TSA opt-out campaign. At the peak of this increase complaints numbered in the region of 5000. The report indicates that over 17,000 complaints were made regarding pat-downs in the two and a half year period. The report also notes that thousands of additional written complaints were received by the Office of the Executive Secretariat and the other offices the TSA chooses to ignore. 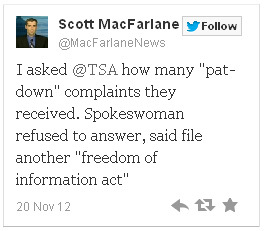 This indicates that TSA has attempted to downplay and cover up the amount of complaints it has received. The report also refers to comment cards, noting that they were not in use at all the airports the GAO contacted, and that “TSA does not have a policy requiring that complaints submitted using the cards be tracked or reported centrally.” The report also states that “local TSA staff have discretion in implementing TSA’s complaint processes, including how they receive and document complaints,” and therefore “the full nature and extent of complaints” goes undocumented. The TSA routinely claims that millions of travelers pass through the federal agency’s security procedures every year without complaint. However, when complaints are made, the agency is loathe to make them public. It took a staggering four years for the TSA to acquiesce to a Freedom of Information Act request filed by ProPublica’s Michael Grabell back in 2008 which asked the agency to reveal details of passenger complaints. In addition, the vast majority do not go the route of submitting a lengthy formal complaint. As we have previously noted, the ACLU has been inundated with complaints, and previous studies have indicated that up to 90% of frequent flyers are highly dissatisfied with the TSA. As usual, the mainstream media is nowhere to be seen on this issue. There are barely any reports from any mainstream source on the new GAO report, despite it having been released a week ago, and despite it being more than newsworthy considering it is the holiday period.